Regency London: a hotbed of robbers, ruffians and imposters…A girl might as well put her faith in a highwayman! Georgiana Grey is independent, outspoken and determined to follow her own path regardless of the cost to her social position and reputation. Sir Robert Foster, a prominent but unpopular citizen, is murdered close to her home, apparently by the Crimson Cavalier, a colourful and infamous highwayman. Georgiana has her own reasons to be certain the Cavalier is not to blame, and sets out to track down the real culprit. She discovers plenty of people with good reason to wish Sir Robert dead, but her quest for the truth is obstructed on all sides. 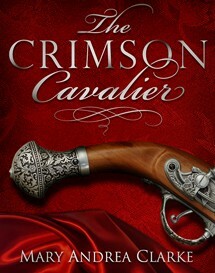 As the net closes on the Crimson Cavalier, her own life could be at stake.